New York, N.Y., recently report- ed higher sales and earnings for its third quarter and 39 weeks ended December 26, 1982, com- pared with the same periods a year ago. John T. Gilbride, chairman, at- tributed the improved results to increased revenues from contin- ued construction of guided mis- sile frigates (FFGs) for the U.S.
Navy, which more than offset lower naval repair sales and a decline in commercial ship repair work reflecting reduced interna- tional and domestic shipping ac- tivity on all three coasts. Los Angeles and Seattle divi- sions ahead of schedule and be- low budget. West Coast repair capacity. The newly acquired San Francisco fa- cility has contributed a $50-mil- lion shiprepair backlog since No- vember 1982. "San Francisco's excellent facilities, featuring a mammoth 65,000 displacement ton drydock and those of Seattle and Los Angeles, put Todd in a strong competitive position to obtain additional naval work, which is expected to increase as the Navy's new homeporting dis- persion policy is implemented in these three leading Pacific Coast ports," Mr. Gilbride noted. The company's commercial ship repair revenues declined approxi- mately 20 percent from last year's level, reflecting lower shipping activity. DSS-V electronic shipboard inter- face units, and automatic depth control systems. Delivery of the new order is scheduled in the third quarter of 1983. And they are backed by an interna- tional network of sales and service. You will find Johnson Duramax Bearings installed on practically every type of vessel from fish boats and crew vessels to pilot vessels, harbor tugs, dredges and river work boats. GROOVE of installation and lowered main- tenance. Bearings are available in a full range of shaft sizes from 3/4 inches through 15 inches. 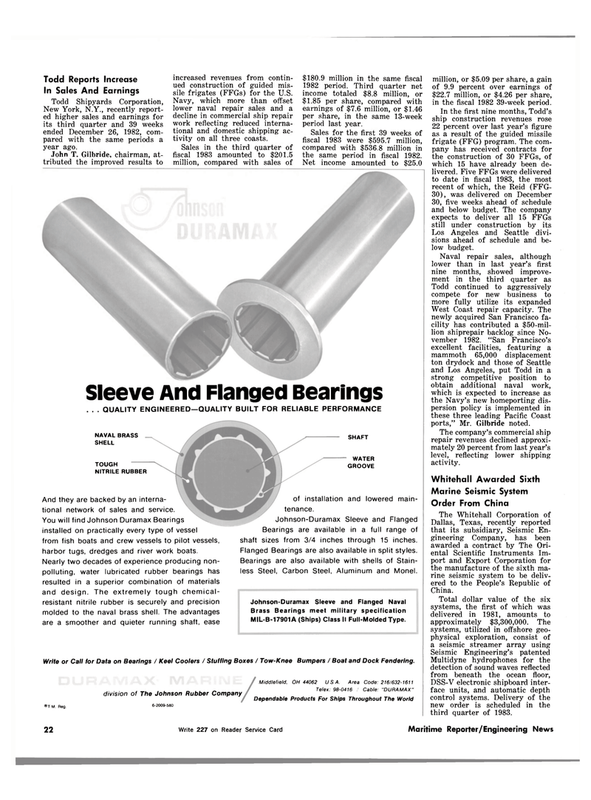 Flanged Bearings are also available in split styles. Bearings are also available with shells of Stain- less Steel, Carbon Steel, Aluminum and Monel. MIL-B-17901A (Ships) Class II Full-Molded Type. Telex: 98-0416 / Cable: "DURAMAX"